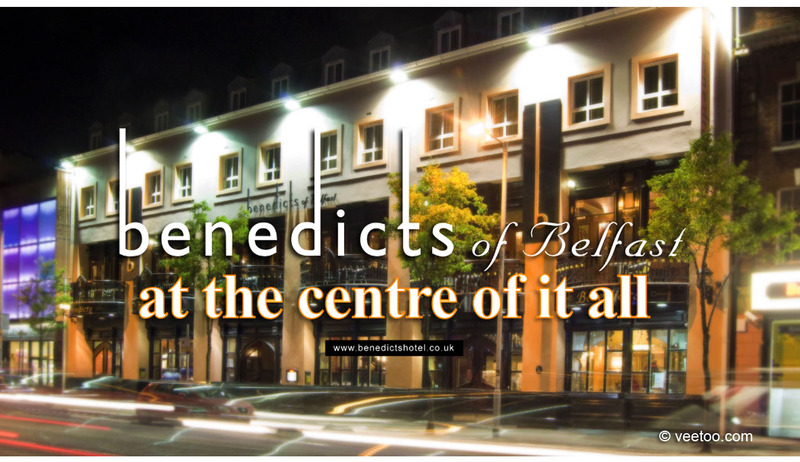 One of Belfast’s most established hotel, bar and restaurant establishments, Benedicts of Belfast, commissioned veetoo to produce a video production in Belfast to be exhibited as a cinema commercial that would appeal to a young demographic interested in spending the weekend in Northern Ireland’s capital city. 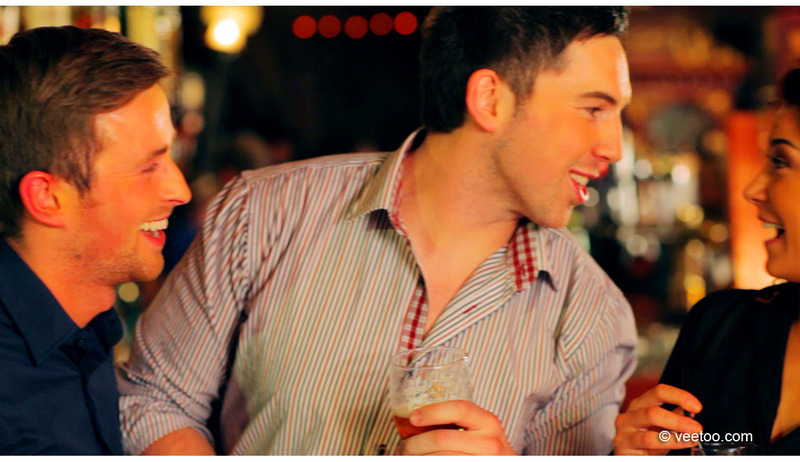 Tasked with this video production, veetoo developed a script that focused on a group of three young couples visiting Belfast for the weekend to shop, visit local tourist attractions and enjoy the various facilities within Benedicts of Belfast. We cast the acting talent locally by providing the client with an online casting facility of those we believed would be suitable for the project. After arriving at six definitive actors we hit the town running (literally), by compressing what should have been a three day video shoot into one filmed over one and a half days – meeting the client’s budget and deadline for their first video production in Belfast. As we wanted to start the commercial using fast changing photographs, supposedly taken by the six characters during their visit to the city, video production began with the cast being photographed at Belfast City Hall, before taking them to the city’s primary shopping centre, Victoria Square, where we photographed our male lead a bit worse for wear as he is tasked with carrying the shopping for not only himself but also his five friends. After some hard and fast retail therapy, the six friends were photographed clowning around in front of Belfast’s Titanic Centre before we broke for lunch and discussed the filming schedule for the video production filming in Belfast (at Benedicts of Belfast) that would take us through to midnight. Scroll down the page to see the screen shots from the primary scenes, along with sections of the shooting script from this Belfast video production. 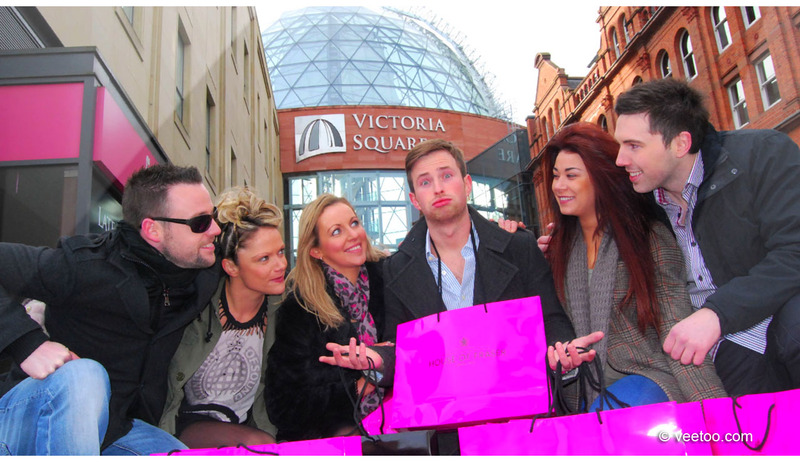 Setting the scene – a group of six friends, visiting Belfast for a weekend, enjoy some retail therapy as they visit the cities main shopping mall during sight seeing trip in Northern Ireland’s capital. This photograph from the video shows one of the six looking exhausted after being assigned as official bag carrier for the day. 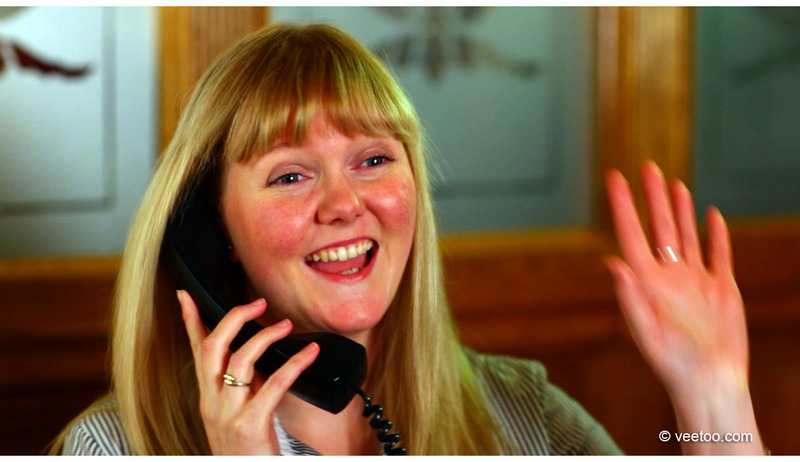 Home from home – quickly introducing an emotional connection with the audience, the first shot inside Benedicts shows the upbeat warm and welcoming smile of one of the hotel’s reception staff, as she greets the six travel weary friends to Benedicts of Belfast, their home from home for the weekend. 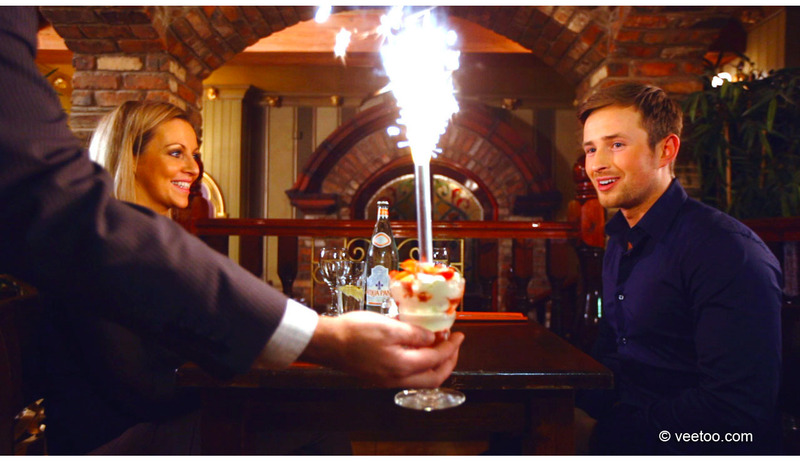 One on one time – introducing this scene, we follow the hands of the maitre d’ as he serves a sumptuous desert as two of the friends enjoy a romantic meal for two. The other friends then crash the party and drag the two lovers on to the hotel’s entertainment driven bar below. 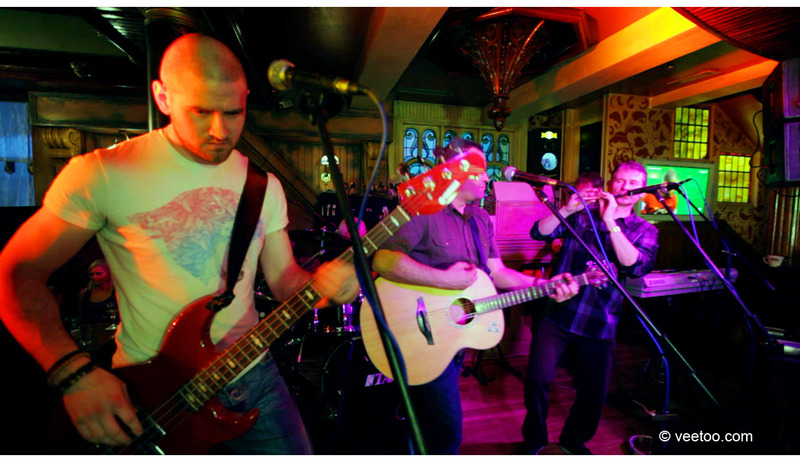 Keep it engaging – we are then introduced to the bar via this wide shot of the resident band as they pump out both traditional Irish music and generic pop cover tunes in the hotel’s old world themed bar. 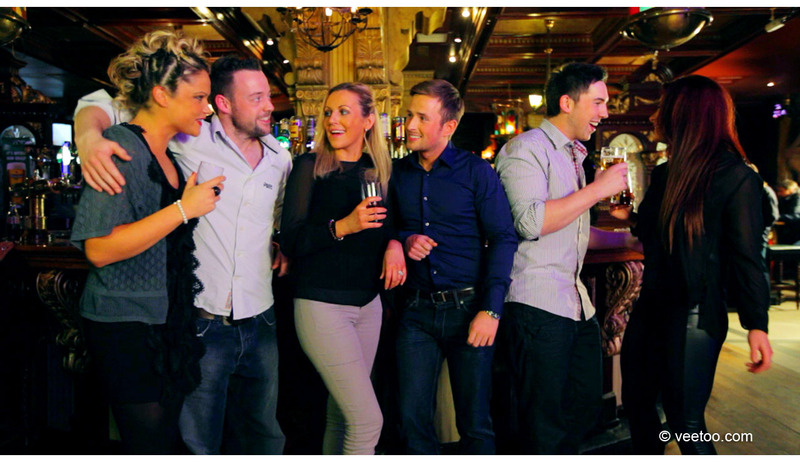 Into the swing of things – this shot, of the friends relaxing and enjoying the craic at the bar, was created to show the ambience within the traditional historic themed decor in one of Belfast’s premier hotel, bar and restuarant complexes. 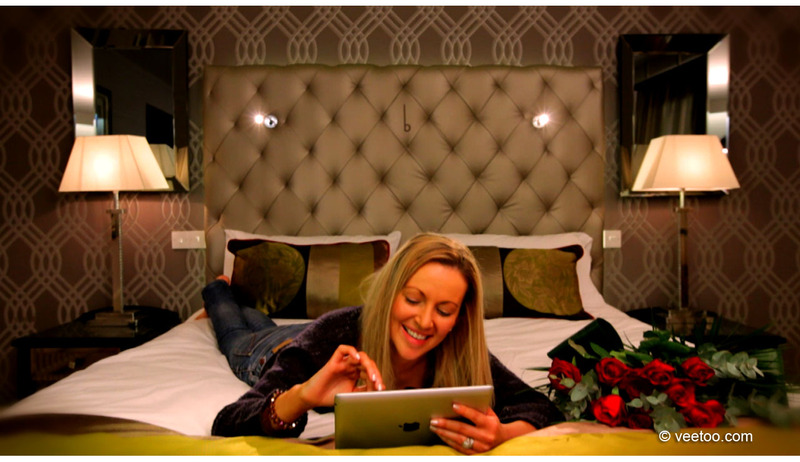 Happiness is a thing called chat – ensuring we continue to engage, we cut in tighter on the friends, showing happiness and excitement on their faces, amplifying the bar’s emotional appeal to the target audience.